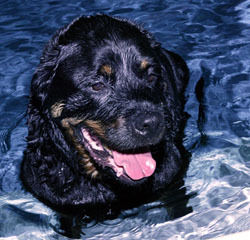 Doggie Dome Swim Spa is dedicated to my best friend Gouda who sadly has passed away. He will be greatly missed by me, his dog friend Paris, all his dog friends and anyone that ever came in contact with this special being. Through Gouda’s encouragement, knowledge and persistence, the Doggie Dome Swim Spa was created, and is striving to help every dog that comes to the facility in the same ways Gouda enjoyed, with all the benefits this wonderful facility has to offer. At a year of age, Gouda was diagnosed with severe hip displasia. He was having problems moving and in pain from time to time. The only relief was in the form of medications that in time could destroy his kidney and liver. I had to find something to help him and keep him healthy. I spent days, weeks and months researching and speaking to people and doctors about his diagnosis. My options were to attempt natural methods or to perform a very expensive surgery in hopes that he would be able to withstand the side effects or damaging other areas causing more surgery in the future. Gouda was not a strong dog and would not have been able to withstand major surgery. Once down he may not have gotten up again. I decided to use a natural diet with supplements and hydro therapy. I installed an Aero Dome to continue his swimming therapy most of the year. One year later I had a dog that amazed everyone in his new found youth. He had a young female companion, Paris who loved him to death and looked forward to their play time. Gouda was well again. Gouda led me on a journey that led me to countless opportunities to witness healing on levels that I had not ever imagined. He reinforced my knowledge and beliefs of the healing powers of warm water. My dream only became a reality through Goudas coaching to share our gift with others. I will always dedicate my life to helping all dogs in Gouda’s name. Gouda sits at poolside everyday and helps me with everyone who needs it. His spirit is always with these dogs to help them on their difficult journey. Not a day goes by that I am not eternally grateful for Gouda. I will miss him always and always honor him with every dog that I am blessed with helping.